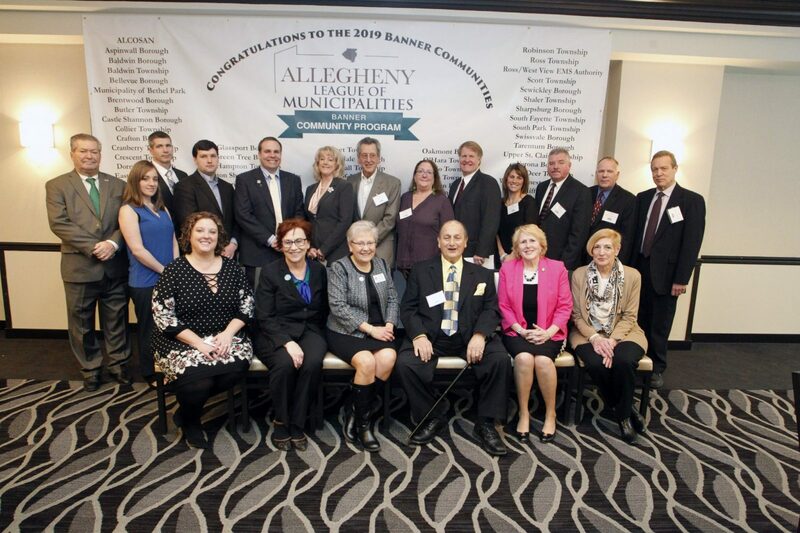 PITTSBURGH – West Mifflin Borough was honored at a ceremony on March 8, 2019 as a 2019 Banner Community. The program, sponsored by Allegheny County and the Allegheny League of Municipalities, recognizes communities that show a commitment to professional development, prudent fiscal management, transparency, accountability, and proactive communications to engage community stakeholders. A total of 65 municipalities and four municipal authorities were recognized this year, the program’s seventh year. A total of thirteen municipalities and municipal authorities received the designation for the first time this year: ALCOSAN, Aspinwall, Baldwin Township, Crafton, Hampton Shaler Water Authority, Harrison Township Water Authority, Leet, Marshall, Oakmont, Pitcairn, Plum, Ross/West View EMS Authority, and West Mifflin. West Mifflin Borough is a member of the Allegheny League of Municipalities, a nonprofit organization created in the early 1960s to coordinate the needs of the area’s local elected officials. In 1974, it was officially established as the Allegheny League of Municipalities to coordinate, advocate and educate the hundreds of elected officials within its member municipalities in Allegheny County and southwestern Pennsylvania. The organization educates elected officials, delivers essential resources, and advocates for sound policy and legislation.